ELECTIONS for the new district councils in in Northern Ireland were postponed in October, 1972 until the next spring. News of the postponement of the elections was met with a favourable reaction in general. The postponement of the elections was the result of pre-sure from various parties on Mr Mr William Whitelaw, the Secretary of State for Northern Ireland. It was felt that the original election date was not a suitable time for an election in view of the situation in the province. A Unionist Party spokesman said they welcomed the decision and that security must always be guaranteed to voters and candidates. IN 1985 The Princess of Wales promised to return to Northern Ireland with her children. Princess Diana, who made a triumphant first visit to the province made her 'I'll bring William and Harry next time' vow in Hillsborough. The intention to introduce the Royal Princes' to the Ulster public was confided to the Mayor of Lisburn, Councillor Walter Lilburn. Councillor Lilburn became privy to this exclusive information during his chat with the Princess when she dined at Hillsborough Castle. 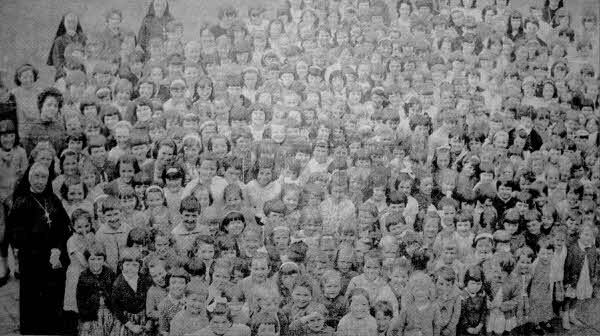 Maura O'Neill was just 14 at the time this picture of the staff and children of the all girls Sacred Heart of Mary convent was taken. 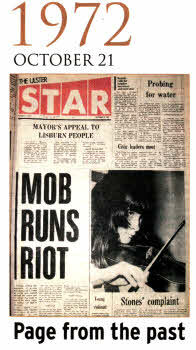 She left the newspaper clipping into the office in the hope that it would bring back some happy memories. The picture was taken in June 1965. She got it from her mother who had kept it. The school was at Castle Street where the old St Josephs Primary now stands. Maura is in the picture along with her two sisters. SPECIAL Watch groups were set up among Lisburn's businessmen in October, 1971. Every night when the shops closed the men took to the streets keeping an all-night vigil on their premises. The aim of the operation was to assist the security forces in their bid to curb the activities of IRA bombers who, it was reported, had been terrorising Lisburn people. The decision to form the vigilantes was taken only hours after another night of bombing by terrorists and followed a two hour meeting businessmen had with representatives of the Borough Council, Chamber of Commerce, local police chiefs and Army officers. The new movement was know as Lisburn Central Security Group. Mayor Hugh G Bass led a deputation to Thiepval Barracks to discuss the security position in the town in view of the attacks on local premises. THE Star reported on May 28, 1966 that the Queen and Duke of Edinburgh were set to make a brief stop in Lisburn during their visit to Northern Ireland in July. They would arrive at Aldergrove airport on Monday, July 4 and their first engagement was to be the official opening by the Queen of the Queen Elizabeth Bridge in Belfast. Later the Queen and the Duke were to lunch in Belfast City Hall as guests of the Lord Mayor and Corporation. It was reported the Royal party would return to Government House, Hillsborough in the afternoon, to attend a garden party in the afternoon and in the evening a visit to Balmoral showground's to see Somme veterans and attend a drumhead service to commemorate the 50th anniversary of the Battle of the Somme in which men from Lisburn and all over Northern Ireland fought and died. 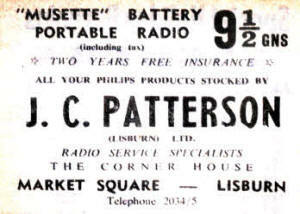 IF you fancied a new portable battery radio then this item was on offer at J. C. Patterson, Lisburn in 1958. The Queen and Duke were to stay overnight at Government House and leave there at 11.00am to visit Lisburn. Arriving at the Assembly Rooms in Market Square after 11.00am they were to greeted by the Mayor, Deputy Mayor, Aldermen and Councillors and officials of Lisburn Borough Council and Mr Brian McConnell, MP, the Minister of Home Affairs and Sir Knox Cunningham, MP for South Antrim at Westminster. Council members' wives were looking forward to seeing the royal party. After leaving the Assembly Rooms the Queen and Duke were to drive to the new Queens University playing fields at Upper Malone. The Queen was also to open the university's new social science building. BRAIDING machinery went on fire at the Barbour Campbell Threads. Ltd. Hilden Mill in 1985. Staff fought the outbreak, caused when one of the machines over heated, until the fire brigade arrived. Two fire Brigade units, quickly on the scene, dampened down the baize, using extinguishers. The machines were back in operation the following day after being cleaned down. It is understood that ponce residue on the machines ignited, causing the blaze. THERE was great news in November, 1969 when it was announced that there would eventually be 116 given jobs in a new Ministry of Commerce advance factory on the Ballinderry Road. Machinery was to be installed in the factory which would be used for the manufacture of hydraulic equipment for moving vehicles and cranes. The factory was leased to Burgear Hydraudics Ltd.